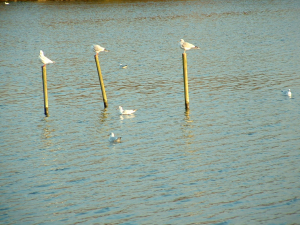 Observation - Black headed gulls? - UK and Ireland. Description: Medium sized gull, mostly white with small dark marking on the head and blaxk tipped tail feathers. Wings light grey. Medium sized gull, mostly white with small dark marking on the head and blaxk tipped tail feathers. Wings light grey.